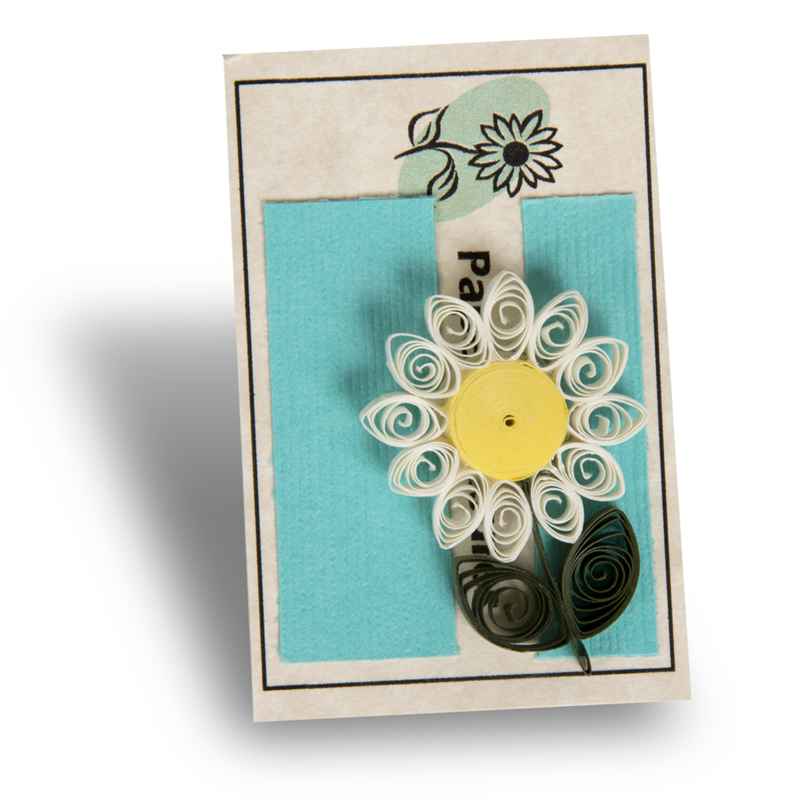 This delicate daisy pin is made of paper with quilling, an ancient art updated by using modern materials and techniques. The delicate daisy has long been associated with innocence and gentleness. By Paper Treasures of Topeka, Kansas. Kathie (Kilhefner) Duguid of Topeka, Kansas, applies the ancient art of quilling to create art from tiny paper scrolls. These unique pieces include jewelry, flowers, bookmarks, and decorative items. Duguid began quilling many years ago as a hobby and way to create unique Christmas and Easter gifts. From the tiny coils and scrolls of paper, she creates beautiful jewelry, flowers, bookmarks, and other decorative items. Duguid’s husband, Greg, handcrafts custom made tools for her quilling. He also makes wooden bases, metal hangers, and other display items. The art form of quilling began to flourish in the early 17th century. French and Italian monks and nuns made the first pieces using paper from old documents, letters, and gilt-edged pages. They rolled strips of paper around a large feather quill, creating scrolls and coils to decorate religious symbols and provide detail to pilgrimage mementos. Inspired by this quilling process, Duguid updates the tradition with modern materials and techniques.